The drone industry is really taking off (pun intended) and drone technology is improving constantly. You can find different types of drones for delivering items, recording videos, and much more. At Dronethusiast we understand that a lot of you are out there trying to start a business using drones. That’s why we recommend you use Drone Pilot Ground School to learn to fly and get your 107 license to fly from the FAA. Drone Pilot Ground School is the best course offered and you can get a special limited time deal because you’re a Dronethusiat reader. Click here to get your discount. Read more about drone training courses on our best drone courses page. It is no surprise that more companies these days are looking to get different drone pilot jobs or drone operator jobs filled than ever before. But what types of drone operator jobs are out there today? The drone industry is opening new doors to many new careers as drone pilots in the air force, real estate, camera operators, unmanned aerial work, aerial photography, precision agriculture, law enforcement, and many, many more. In this article, we will discuss a few of the many UAV pilot jobs that are available in every industry from filmmaking to construction. Here are five different industries that are offering jobs to drone pilots and drone operators. If you want to turn your drone hobby into a great career, here are some things you might consider looking into! 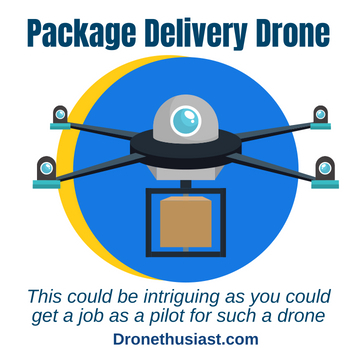 Some of the most popular drone operator jobs out there are expected to be for delivery purposes. Amazon and Google have been testing the drone delivery process for a while now. This is to determine how well packages can be delivered by such items. This could be intriguing as you could get a job as a pilot for such a drone. It would entail identifying a location to send an item out to and also with getting a drone loaded up the right way. This is a special kind of job but the requirements for making it work might be a challenge to handle. The rules for using drones in certain environments, particularly in cities, are constantly being revised. The odds are it might be difficult for some companies to offer these jobs in certain regions. It might be easier to find them in more wide-open spaces or at least in spots where the laws on drone usage aren’t as extensive as they could be. Drones have revolutionized the field of aerial video. Before, you had to buy or rent an incredibly expensive helicopter just to get a sweeping bird’s eye view shot. Now, anyone can film from overhead. Better still, drones can get into places that a large, unwieldy helicopter can’t, and as a result we’re starting to see the creation of new film techniques that have never existed before. True, video drones are mostly used for event photography, corporate video shoots, or for commercial shoots. 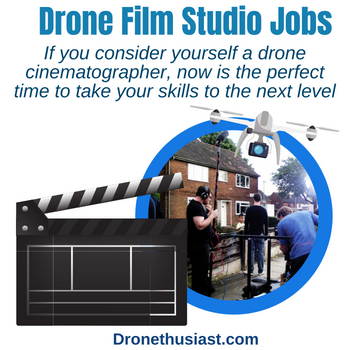 But did you know that major Hollywood films have also used drones for aerial establishing shots? The Wolf of Wall Street, Jurassic World, Captain America: Civil War, and the 2012 James Bond film Skyfall are just a few movies that feature video footage taken by drones. 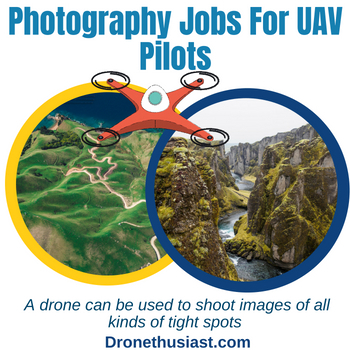 If you consider yourself a drone cinematographer, now is the perfect time to take your skills to the next level and see who’s hiring for these exciting UAV pilot jobs. 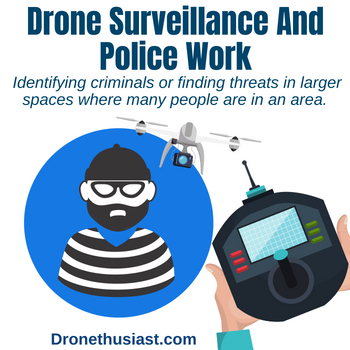 Drones can also be used for police and surveillance uses. This works in that a drone can be taken out into the sky and used to review items like roads and buildings and other spots from high above. This is often used as a means of identifying criminals or finding threats in larger spaces where many people are in an area. Such drones are designed to be made with cameras that entail more in-depth shots. These include items that use frequencies to see through items. This is a special form of surveillance that can help with finding different items in many spots even if they are relatively well-hidden. This is an attractive type of drone operator job but it would require plenty of training on your end. Also, you would have to go through several background checks to see that you are a suitable person who can handle such a drone without any complications involved. Drones are also being used more and more in the field of construction, mostly for design and planning tasks. 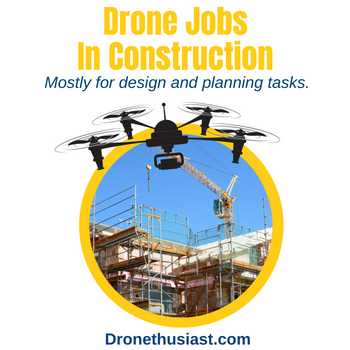 Construction involves massive, complicated, time-consuming projects, and videos or photos taken from a drone pilot job can give workers a clear idea of how a construction project is going and what still has to be done to get the job finished right. Drones with scanners are being used by drone operators to build detailed maps of construction sites before the project even begins! If you want to get in on the “ground floor” of UAV pilot jobs, construction might be your ticket to a great new career. Aerial photography is the most common drone pilot job. Unlike other cameras, a drone can be used to shoot images of all kinds of tight spots. A drone camera can be used for many projects and can help with spotting many things from high up in the air. They are also often used for event photography. Since there’s so much competition in this field, how can you stand out if you’re looking to get involved with this job for drone operators? Well, taking a flying camera into the air and snapping a picture isn’t that hard. Learning the basics of photography as an art form and learning how to take spectacular drone shots – rather than a simple photograph that anyone else could take – will go a long way towards boosting your profile. There are a lot of photographers, and there are a lot of drone pilots. But if you can do both things well, you’ll have a drone pilot job for life. Tens of thousands of drone pilot jobs are already available in the United States, and that number is only going to continue to grow over the next five years. Because there are hundreds of different uses for unmanned aerial vehicles, the number of industries that use drone jobs is also expected to grow. By 2020, Bloomberg believes that the drone market will be 33% larger than it is today. That’s an incredible amount of growth in such a short time. And if you already have a good understanding of how to fly a drone and have the money to purchase a commercial model and a license, you’re already ahead of the curve as far as drone operator jobs go. Even if you don’t want to make drones your full-time source of income, learning how to fly drones may be a useful skill to have on your resume if you work or plan to work in any of the industries we mentioned above. It can be a good way to differentiate yourself from the competition. If you get any job where you are paid for using a drone, you must license that drone with the FAA. Licenses are not required for every recreational model of drone, but as soon as your drone use becomes commercial you must acquire a drone pilot’s license. You can learn more about how to get your drone license by reading our guide here. The market for drone operator jobs is only going to expand in size as the years go by and UAV technology becomes more advanced. So if you’re looking to turn your hobby into a career and find a drone pilot job in any of the industries above, don’t wait! Now is your chance to do something really special. Just last week I came across a video of a flamethrower drone in China that was used to burn debris off power lines – that surely is an interesting job to do. Hadn’t really thought about drone jobs per se, but your piece really made me think. Following that line of though, what do you think of artificial intelligence – do you see drones evolving at even a faster pace, making use of AI technology so that they don’t require pilots? FAA Certification for commercial drone pilot require visual line of sight of the drone at all times. Amazon would need a waiver from the FAA to fly without the VLOS rule. Is safety a selective thing?